The Similans lie about 50 kilometers due west of Khao Lak. The group comprises nine major islands and at least as many small islets. All the islands are covered in Jungle, with several powdery white sand beaches to be found at the waters edge. Around the islands are more than 25 dive sites, which many say are among the best in Thailand. Diving destinations around the Similan Islands. The islands are a national park, and thus practically deserted. Camping is allowed, but most people visit the Similans on a liveaboard cruise from Phuket, or a day trip from Khao Lak. Note that the islands are effectively closed during the rainy season, from 15 May to 15 November, although some boats do visit there during this time. The main Similan ground can be divided into three sub-groups: The southern-most three - Islands 1, 2 and 3 - are a coral and marine life rehabilitation area, where diving is prohibited. The middle group consists of Islands 4 to 7, and is home to many of the Similans' most favored dive sites. 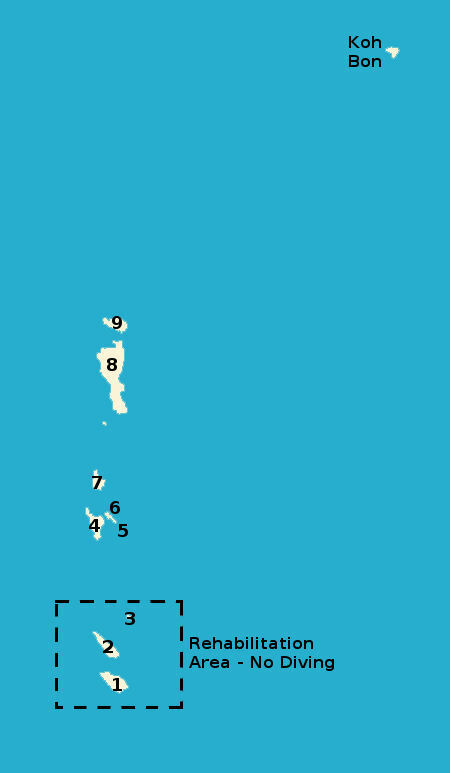 Lastly, the two northern-most islands form the northern group. In addition to the main island group, the Similans National Park also includes the more remote islands of Koh Bon and Koh Tachai to the north. Which sites are the best? That depends on the conditions. Almost all of the sites can be fascinating, great dives. My particular favorites are Elephant Rock and Anita's Reef in the main Similans group, and Koh Bon Pinnacle. Although not part of the Similans, the Boonsong Wreck is not to be missed. Are there any I would give a miss? Well, I have never been thrilled by Koh Tachai Pinnacle; it's just too much "work" for what I've seen. As a national park, there is an entry fee as well as a daily fee for divers. The entry fee for adults is 400 Baht, while the daily dive fee is 200 Baht per day. Do not collect or remove anything, except garbage. Do not hunt, destroy, or do anything that harms plants, animals or the environment. Do not make any loud noises that might disturb other people or the animals.